The White House budget official with a specialty in homeland security nominated to run the Consumer Financial Protection Bureau squeaked by the Senate Banking Committee on Thursday. The vote was 13-12, with all Democrats opposed. Democrats questioned her lack of experience in consumer finance, her ties to acting director Mick Mulvaney and her decision not to release documents related to her work on recent issues such as President Trump’s border crackdown and the government’s response to Hurricane Maria’s devastation of Puerto Rico. “Ms. Kraninger comes with significant leadership experience at federal agencies and on Capitol Hill, with particular expertise in the budget and appropriations processes,” said Sen. Mike Crapo, R-Idaho, chairman of the Banking, Housing and Urban Affairs panel. 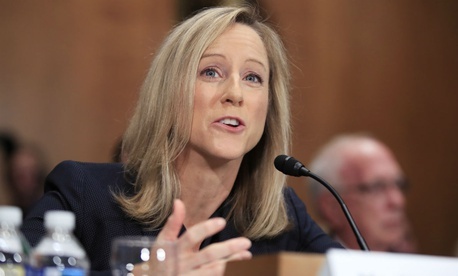 “I have the utmost confidence that she is well prepared to lead the bureau in enforcing federal consumer financial laws, protecting consumers’ sensitive personal financial information, expanding access to credit, and making the bureau more transparent and accountable,” he added, reminding Democrats that the documents they sought about her work in the White House were “related to a deliberative process” that no presidential administration would release. Kraninger declined to point to any areas in which she disagreed with Mulvaney, Trump’s budget director who has been doubling as head of the bureau and altering the direction it took under original director Richard Cordray. Mulvaney, after Trump nominated Kraninger in June, issued a statement saying, “From navigating and interpreting how the federal government supports and regulates financial services for key stakeholders to helping stand up a brand-new federal agency when she was at the Department of Homeland Security in its earliest days, she has the kind of experience Washington so desperately needs. I know that my efforts to rein in the bureaucracy at the Bureau of Consumer Financial Protection to make it more accountable, effective and efficient will be continued under her able stewardship."